One of the most intriguing things about a few days solo backpacking… or in this case packrafting… is the joining up of thoughts seemingly unconnected. The ebb and flow, a continuity of activity that connects the otherwise disparate. Thoughts rise and others fall, and because I’m constantly moving these thoughts are allowed the space to come and go. There is also the wakefulness that comes from immersion in the back country over hours that become days – a paying of attention to raindrops and their patterns on the loch, the waves of sound: Of wind fetched over water, geese honking in flypast formation, the silent presence of a boulder split in two by millennia of freeze and thaw. Sometimes the wakefulness is slow: I sleep when dark comes, I awake with the light. The wheel turns, the solar day must start again. Gradually, I’m back in sync. Sometimes it’s sudden: Look – just how many varieties of lichen live on that rock! 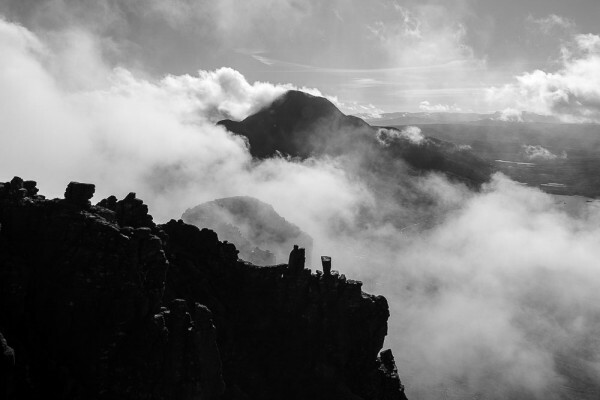 It might be a change in atmospheric pressure or temperature that triggers it, or the deadly presence of the weather on a mountaintop, scoured by spindrift, a wind that forces me to my hands and knees. None of this is laboured, poured over, it happens in the course of the day. Each sense is magnified, partly by the silence of solo travel, and perhaps by its value to me as a measure for my wellbeing in a shifting, mobile environment. I think this is true regardless of activity. It’s to do with time and patience, a putting aside of distraction, an entering into a conversation with my surroundings. A bigger picture, and some vulnerability. There are two strains to the conversation. The ‘awe’ of how small we are. It’s seductive to find oneself so small. It’s arguable that to be put in one’s place satisfies our guilt, punishes the ego, if that’s your thing. Is there a catholic shadow to the Victorian sublime?! But it let’s us off the hook by putting us on one. If we are rendered tiny, insignificant, then we have no agency here: it’s beyond our help, our effect and our control. Our impact is excused. Thankfully, there’s another thread; a stiller, deeper river. It’s of being a part of nature, not being apart from it. It’s being both lost within it, and lost without. It might be a kind of love. We don’t get to leave the table. As in a romantic relationship, if we act up, there are no excuses for poor behaviour – we have to face the music, and ultimately ourselves. The land and my movement through it becomes a mirror. After a few days camping and moving under my own steam, uninterrupted by cars and phones, it feels as if continuous, self-propelled travel may have always been this way. That there has always been an internal dialogue, a inward journey of discovery running parallel to the outward journey from A to B. The word ‘Adventure’ is tired, just another consumable with the shelf life of a Facebook post. Adventure is no longer an adequate descriptor. 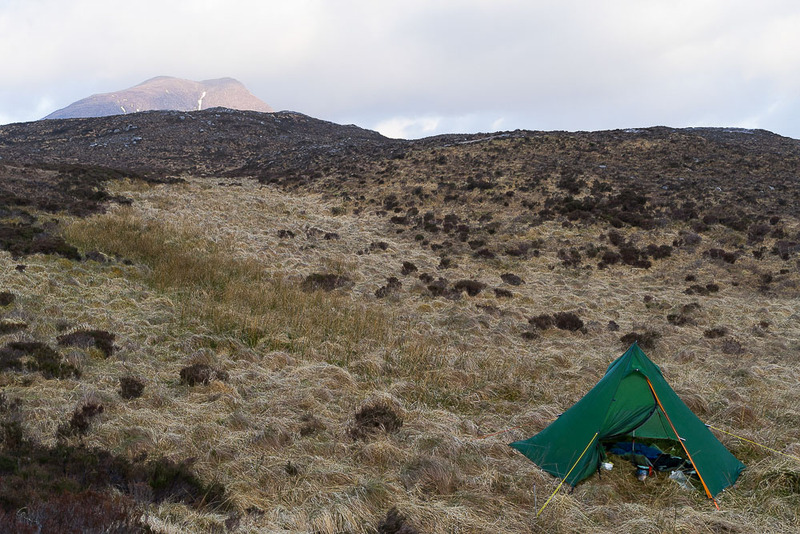 Solo in Assynt, I might be slipping into the stream of time itself. According to Norse legend, this was where the gods practised mountain building. It is on a grand scale. Each hill is a set piece, a stand-alone, an island amongst islands. There are contours, and there are Inverpollaidh contours. Cul Mor bamboozled me. I tried in vain to come off into its northern coire, but a cornice still clung to its brim, too much for my unstable load. 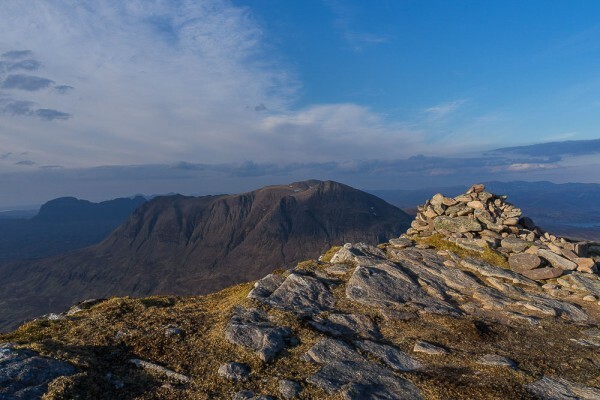 I tried twice over, then to the bealach, all without success. I spent hours backwards and forwards on that high chaparral. But as the sun began to dip behind a white fizz of cloud, I found a tender spot, a door left ajar. Unplanned in the mountains can be the best kind of quiet sorcery, or the worst. This time, I struck gold and chanced upon the ‘hidden coire’ I’d read about. High up, a sturdy burn meandered fast across meadows of deer grass plump with snow melt. Lower down, waterfalls tumbled past ungrazed flowers, ferns and heathers and brown trout darted in a pink sand fringed lochan. 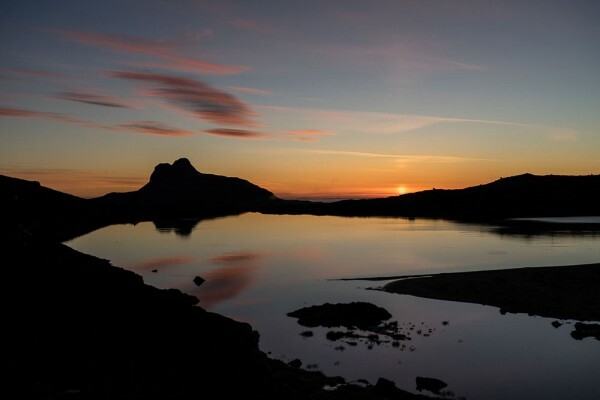 A sunset to end worlds ended my day, Stac Pollaidh framed perfectly over the best. infinity. pool. ever. There was a way off Cul Mor, but not today. Late next morning, I went onto the brim of its hat and aimed for a single chink in the contour lines to meet the ruins of a shieling below. How hard was it here? Was it fertile, did the land yield? I try to tap in, but fail. I reached Eilean Mor in the centre of Loch Sionascaig a good half day later than planned. ‘Big island’ has two hills, a Mor and a Beag. One end of it looks like a First World War film set, the trees distraught and wind blasted. The other is fit to bursting, regenerating well. 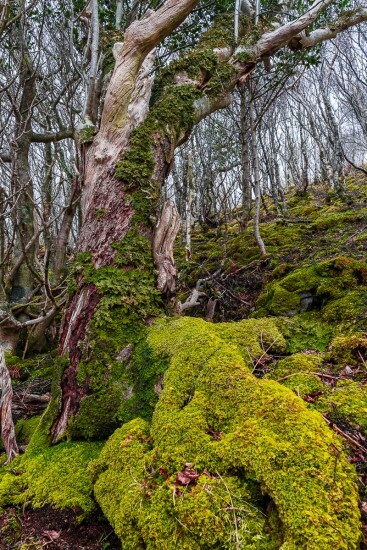 There’s birch, hazel and holly here, and a micro world of mosses. Deer tracks and droppings indicate that this floating larder is too great a temptation for swimming grazers to ignore – they island hop to get here. In the past it was protected as a National Nature Reserve for it’s rare birdlife, but other 2-legged visitors are now allowed. Bearing witness to our presence, there are the remains of a large and unpleasant open toilet, and a huge fire circle. At least for the latter, I can understand how it happens – the perfect end to a perfect day, in a perfect place. Booze carried in on the canoes for the clients, a seeming abundance of deadwood. ‘It’ll keep the midges at bay’… But what will we do when there’s no more wood to burn? This beautiful island seemed to me right then to encapsulate our impact issues perfectly. Wandering through silent branches along thin animal tracks, the earth a rich, dark humus, I have one of those sudden jolts of wakefulness. There is nothing here that’s spare. Everything is food for worms, mutable, ripe. In a very real sense, everything on the island is alive. Do you ever feel wild places as a presence? – like you’re being watched! The mountains of Assynt all push their noses into the westerly winds, the prows of Viking ships, weather breaking onto their craggy bows. The summit of Cul Beag takes this analogy to an extreme. A never-ending up, and when finally reached for a milky, wind torn sunset, a never-ending drop. 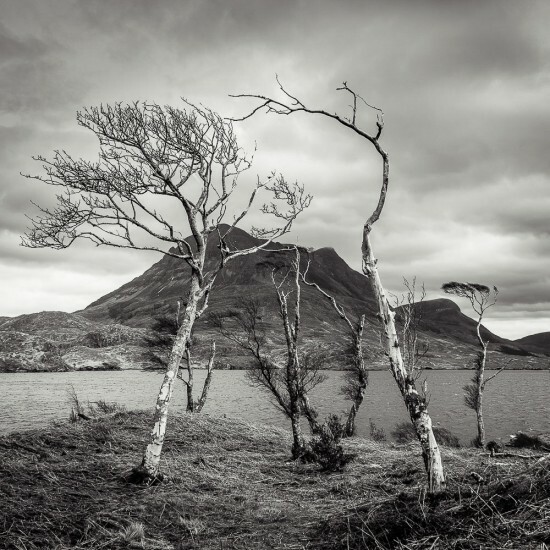 Assynt is landscape as meaty, physical theatre: A science fiction scaled airport of gristly zeppelins poking through an animal skin stretched taut and thin, the bare bones of a homunculus rising from an ooze of mud and bog. The mess of life is here, I skid about on it for half a day, trying to climb Stac Pollaidh in a miserable dreich to no avail. In some ways, these are less interesting hills to be on top of than to stand under. But up on Cul Beag with the fading light, as the wheel turns again, I could fall off the world forever. Which way is up? A few seconds and I’m back to my senses: Down is that way, out of the bloody wind. I love that mountain travel keeps me practical. It stops me floating off with the fairies and Sheila na gigs. Walking out to Knockan Crag, I disturb a pair of nesting Snipe at the side of the track. I’m so grateful to know the names of my neighbours now – some of them at least. What’s in a name? It’s not everything, but it’s a start. Isn’t that the point of all this – to get to know our neighbours, to engage? Even the activity is incidental – just an excuse to get us here and keep us here for long enough for the real work to take root in us.